Riding a moped or scooter is a wonderful and cost efficient way of transportation, especially in college towns and cities where traffic jams and limited parking can extend travel time and be extremely frustrating and stressful. It can help reduce greenhouse gases and slow climate change. For students or commuters, having a scooter makes running errands or getting to work or school a quick and enjoyable and environmental way to travel. A scooter is similar to a motorcycle and can reach speeds of 70 miles per hour so that travel on state roads and interstates is permitted. In Massachusetts, you must have a valid motorcycle license to operate a motorized scooter and comply with all other registration and licensing requirements pertaining to motorcycles. On the other hand, mopeds are automatic transmission vehicles that may have a small engine. It cannot achieve a speed of over 30 miles per hour so that they are not legal on interstate, limited access or express state highways where posted signs exclude bicycles. They can use the bicycle lanes and like a bicyclist, must obey all traffic laws. You must be at least 16 years of age to ride a moped, have a valid permit or license, not travel over 25 miles per hour, have a moped sticker from the RMV affixed to the vehicle and wear a DOT approved helmet. Unfortunately, riders of mopeds and scooters are involved in accidents resulting in severe injuries or death. Like a motorcycle, the riders are only protected by their helmet or leather clothing but are more prone to suffer catastrophic injuries in any kind of accident where a rider is thrown from the bike. What Causes Scooter and Moped Accidents? You can recover compensation in such accidents if another motorist’s negligence caused your accident. Consult with an experienced scooter accident lawyer regarding your legal rights in these situations. In some cases, a road defect may have caused your accident. In cases where the state or a city was responsible, there are strict rules and laws that require prompt notice to the municipality responsible for the roadway on which you were injured. If a faulty brake or steering system or other flaw in the vehicle led you to lose control, you may have a product liability suit against the bike manufacturer or designer. Law enforcement officers in some cases assume that the moped or scooter rider was responsible for the accident, especially if you are a teenager or young adult. A traffic accident report may conclude you were responsible despite evidence that indicates otherwise. It often takes a zealous moped accident attorney to investigate your case and to find evidence supporting your version. Also, despite suffering severe damages, insurance adjusters will try to minimize the nature and extent of your injuries or challenge your assertion that your injury was caused by the accident, especially if you failed to receive treatment until weeks later or you have a preexisting medical condition. For these reasons, retaining a scooter accident lawyer is essential in obtaining the proof necessary to get you the compensation your case deserves. Scooter and moped accidents are just as tragic as any other accident and can result in life-altering changes. 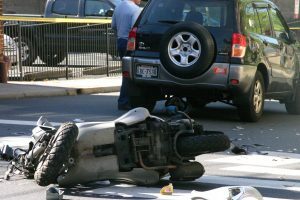 Trust your injury claim to Attorney’s Neil Burns & Roshan Jain, a Boston law firm experienced in moped law and the intricacies and complexities that these cases often present. Call our office today if you or a loved one was injured in a moped or scooter accident for a free analysis of your injury case.